Some items of clothing need that little extra to ensure a perfect fit, and this is where Hook & Eyes come into play. 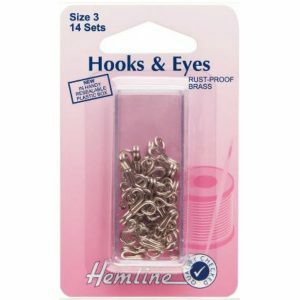 These Hook & Eyes are size 0 and are rustproof brass nickel coated. They are a hidden out of sight fastener used extensively on garments that lie flat and provide a strong closure. Supplied in a reusable plastic box. Some items of clothing need that little extra to ensure a perfect fit, and this is where Hook & Eyes come into play. These Hook & Eyes are size 1 and are rustproof brass nickel coated. They are a hidden out of sight fastener used extensively on garments that lie flat and provide a strong closure. Supplied in a reusable plastic box. 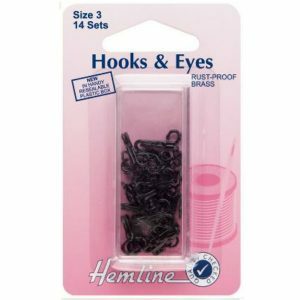 Some items of clothing need that little extra to ensure a perfect fit, and this is where Hook & Eyes come into play. These Hook & Eyes are size 2 and are rustproof brass nickel coated. They are a hidden out of sight fastener used extensively on garments that lie flat and provide a strong closure. Supplied in a reusable plastic box. 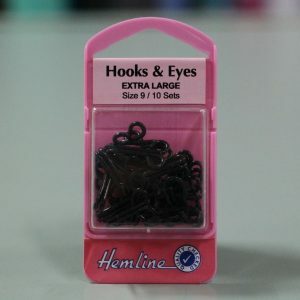 Some items of clothing need that little extra to ensure a perfect fit, and this is where Hook & Eyes come into play. 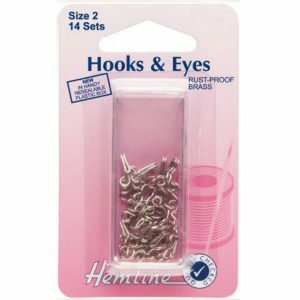 These Hook & Eyes are size 3 and are rustproof brass nickel coated. They are a hidden out of sight fastener used extensively on garments that lie flat and provide a strong closure. Supplied in a reusable plastic box. Some items of clothing need that little extra to ensure a perfect fit, and this is where Hook & Eyes come into play. 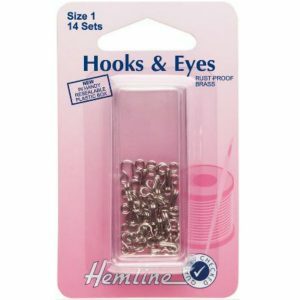 These Hook & Eyes are size 9 and are rustproof brass nickel coated. They are a hidden out of sight fastener used extensively on garments that lie flat and provide a strong closure. Supplied in a reusable plastic box. Some items of clothing need that little extra to ensure a perfect fit, and this is where Hook & Eyes come into play. These Hook & Eyes are size 0 and are rustproof brass black coated. They are a hidden out of sight fastener used extensively on garments that lie flat and provide a strong closure. Supplied in a reusable plastic box. 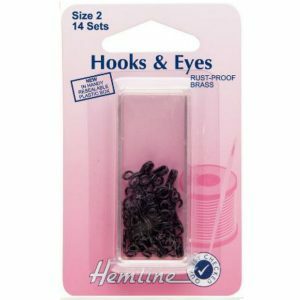 Some items of clothing need that little extra to ensure a perfect fit, and this is where Hook & Eyes come into play. These Hook & Eyes are size 1 and are rustproof brass black coated. They are a hidden out of sight fastener used extensively on garments that lie flat and provide a strong closure. Supplied in a reusable plastic box. Some items of clothing need that little extra to ensure a perfect fit, and this is where Hook & Eyes come into play. These Hook & Eyes are size 2 and are rustproof brass black coated. They are a hidden out of sight fastener used extensively on garments that lie flat and provide a strong closure. Supplied in a reusable plastic box. Some items of clothing need that little extra to ensure a perfect fit, and this is where Hook & Eyes come into play. These Hook & Eyes are size 3 and are rustproof brass black coated. They are a hidden out of sight fastener used extensively on garments that lie flat and provide a strong closure. Supplied in a reusable plastic box. 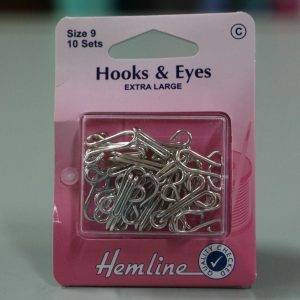 Some items of clothing need that little extra to ensure a perfect fit, and this is where Hook & Eyes come into play. 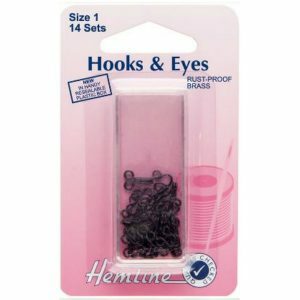 These Hook & Eyes are size 9 and are rustproof brass black coated. They are a hidden out of sight fastener used extensively on garments that lie flat and provide a strong closure. Supplied in a reusable plastic box. Size 3 Black Fur Hooks and Eyes. 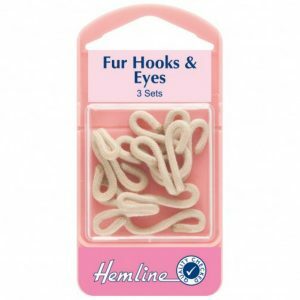 Fabric covered hooks and eyes used as decorative fastenings on garments, especially outerwear and coats. Fasteners lie flat and provide a strong closure. Supplied in a reusable plastic box. Size 3 Beige Fur Hooks and Eyes. 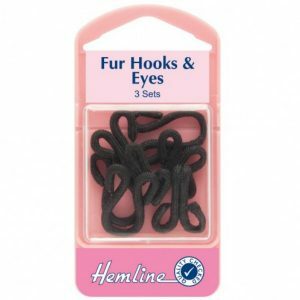 Fabric covered hooks and eyes used as decorative fastenings on garments, especially outerwear and coats. Fasteners lie flat and provide a strong closure. Supplied in a reusable plastic box.